When the Riverside, CA law enforcement agency needed to upgrade their 9-1-1 call center, situated in a former Costco building, they turned to AVS Systems to design a custom system with the capability to quickly and efficiently manage the entire operation. AVS Systems installed a comprehensive system to the Riverside 9-1-1 call center to help better respond to emergencies in the town. Outfitted with an array of operator stations, 50-inch flat panel video displays and cable set-top boxes for monitoring current events, the team at AVS Systems created a customized user interface replicating the seating position of each operator on an iPad mini. Call center managers can tap any seating position on the iPad mini and immediately direct whatever is on that operator’s screen to any of the flat panel displays. This control flexibility maintains transparency between operators and managers for more rapid assessment and faster response times. “There’s a total of 14 55-inch monitors that surround all the operators,” said Art Daza of AVS Systems. “The fire department dispatches information on these monitors. They wanted access to pull up any of the news channels or pull up any computer screen that an operator is using.” The iPad Minis help the call center managers control what goes up on the monitors from anywhere in the building, he added. AVS also installed On Controls technology, designed to both manage emergencies and to train staff. The system is also tied in to three computers that interface with the traffic cameras located throughout the community. Call center administrators wanted an interface so intuitive that it required no user manual. The image displayed on the iPad mini represents the call center floor plan, and tapping on any station gives the manager instant access to controllability. The iPad minis deliver lightning-fast response times by controlling the delivery of high-definition video over IP, thanks to the On Controls interface with a Cisco 48-port switch that acts as a matrix for all video content in the system. This also results in a compact, consolidated equipment rack that requires minimal space and is easy to maintain. Three iPad Minis were programmed to allow managers at the Riverside 9-1-1 call center to control the screens without having to stand in one area. During installation, Daza said the call center was on active duty, meaning they had to install everything without disrupting daily work. The other big challenge Daza and his crew at AVS Systems faced was making the system accessible from the outside. The result was a comprehensive and efficient system that allows the fire and police departments to easily coordinate dispatch. Users have access to cameras at all intersections in Riverside, and can tap into different systems in real time to help in an emergency. "The On Controls solution installed by AVS Systems has greatly expanded the 9-1-1 dispatch center's access to real-time information,” said Lieutenant Steve Bradshaw of the Communications Bureau in the Riverside Police Department. 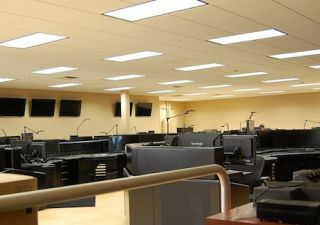 “With the On Controls system we have been able to share three cable TV boxes, one conference room presenter, and five computer inputs across ten display screens. We now have the ability to utilize a simple HDMI cable in our conference room to connect a computer source for training or meetings. We are able to display any combination of our video sources across the displays so we can dynamically shift the information displays as the activity changes. During a large vegetation fire we can monitor local TV networks on several displays, as well as presenting the real-time location of fire apparatuses on another display. The On Controls iPad mini control interface is simple, intuitive, and provides us with several controllers to manage the content on the system as needed."